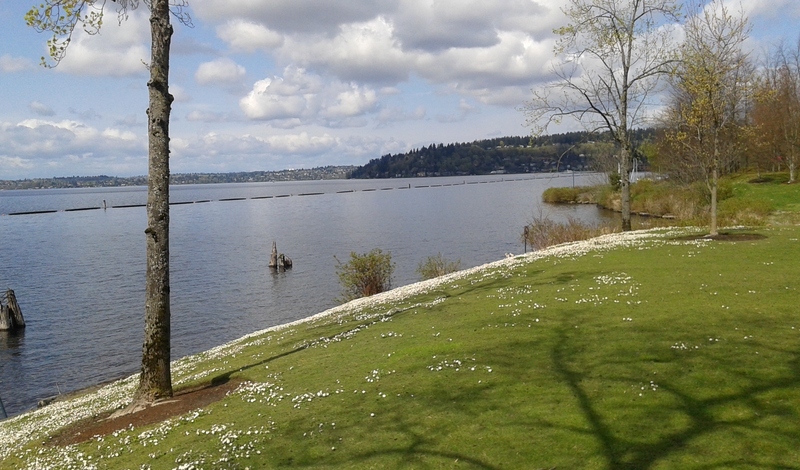 The sun called me out for a walk today and my feet took me to Gene Coulon Park. It’s a place for walkers. No animals and no bikes. While I am an animal lover and I think bikes are cool, it is great to stroll and not have to worry about fangs or whirling spokes. Everyone ambles along the lakeside at their own pace, frequently passed by joggers in all kinds of healthy living gear. I am sure everyone’s arteries are greatly enhanced by their fluorescent sneakers. 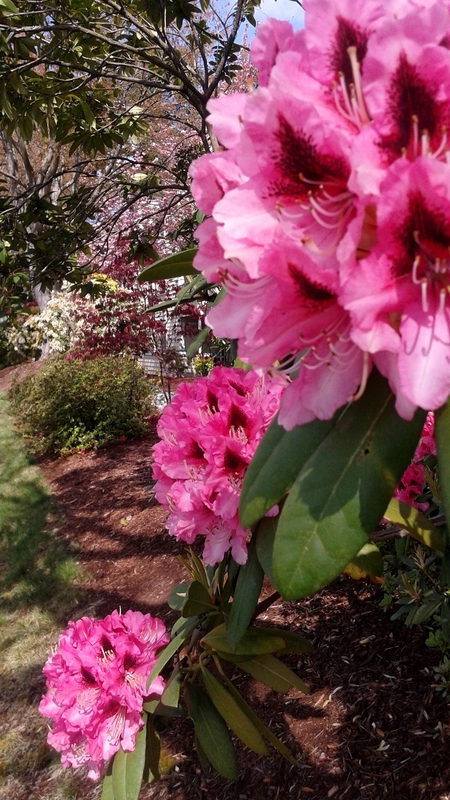 Strolling toward the park entrance, I put on the brakes to enjoy the siren call of rhodie trumpets. 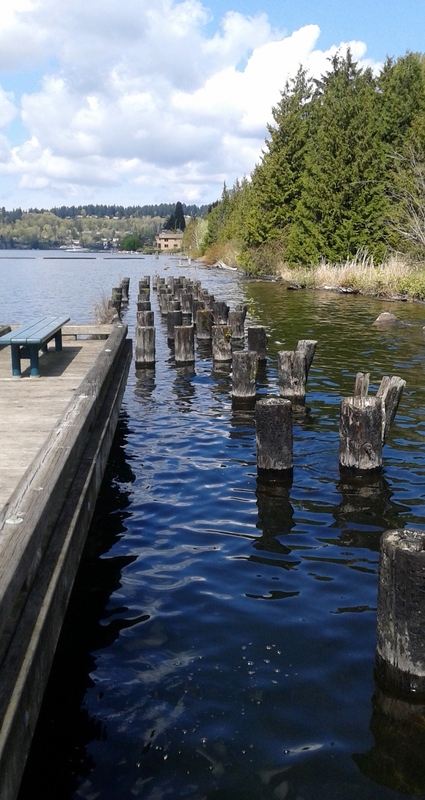 At the park, I admire remnants of an old pier marching alongside a new one. 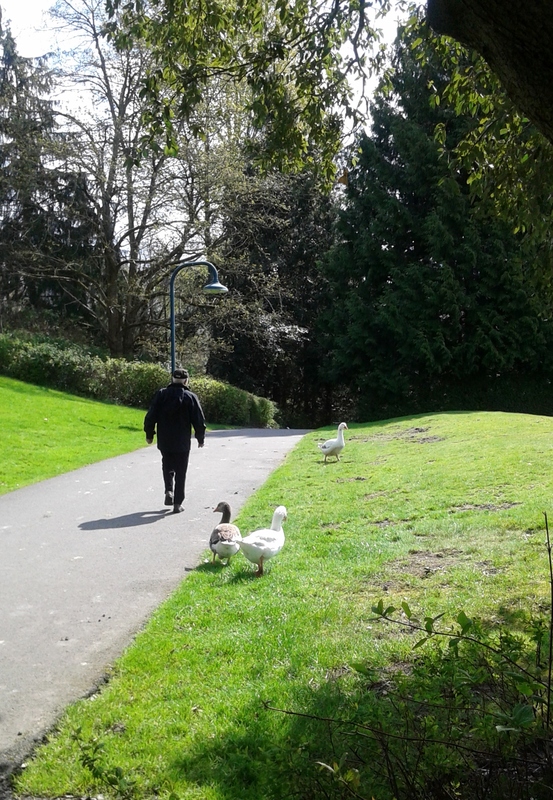 Then a small gaggle of domestic geese, trying out the spot usually occupied by Canada geese, taking a walk on the wild side. I look for the turtles that usually emerge from the mud in springtime to sun on the partially submerged logs off the lake shore, but they must still be slumbering in the depths. 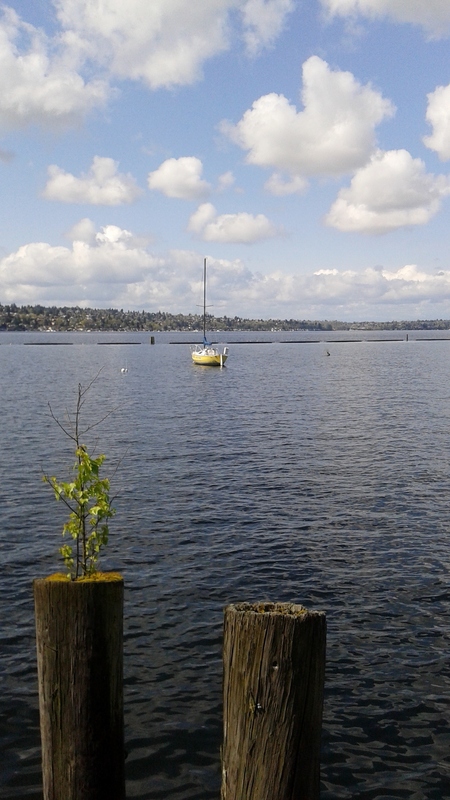 There’s a sailing club at this south end of Lake Washington and I have made many photos of their little crafts bobbing in the water. Today the clouds are bobbing overhead as pretty as a dream. 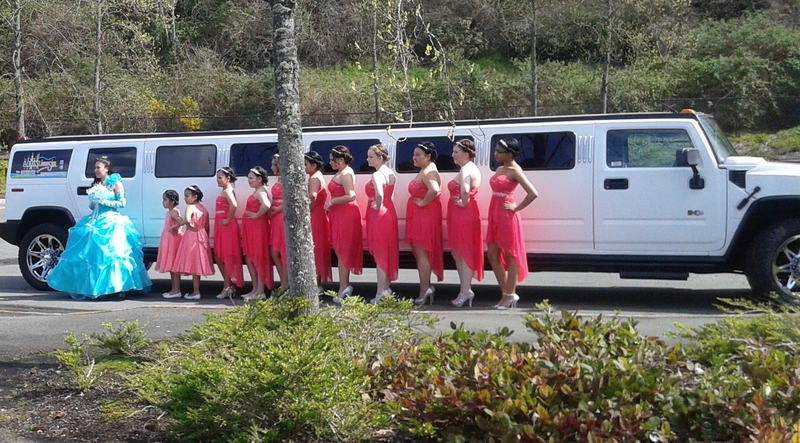 Wandering along on a spring day in the park would hardly be complete without coming across a wedding party, adding Technicolor dresses and lovely tresses to the greenery. All of us in jeans and T-shirts stop a minute to enjoy the scene … I’m glad for them that it’s not raining. Around the corner I find a solitary sailor perched on a rock, much better than a turtle. A field of daisies has popped up and I brave the very wet grass to take in their pungent fragrance of newness. It’s a day of tapestries, the kind that a park encourages, with life flowing along the paths and roadway in full regalia. Around the curve and along another pier, there is a group of guys who’ve launched a squadron of model boats. 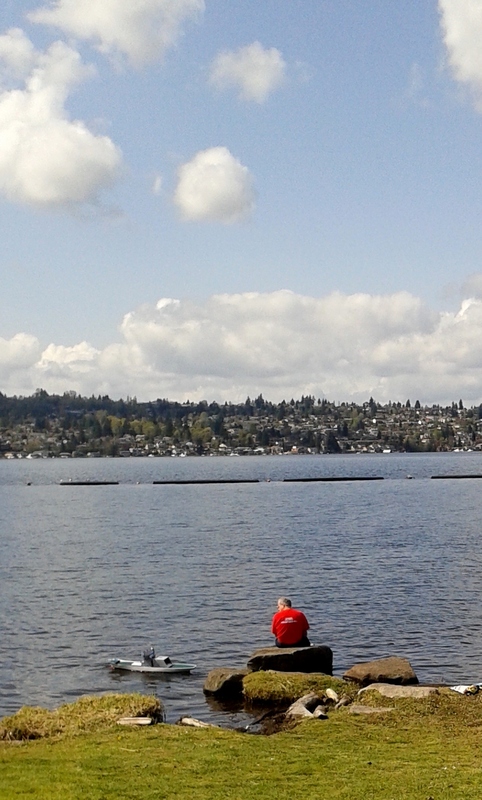 They appear to be racing but are silent as golfers, focused on their marker buoys in the water. 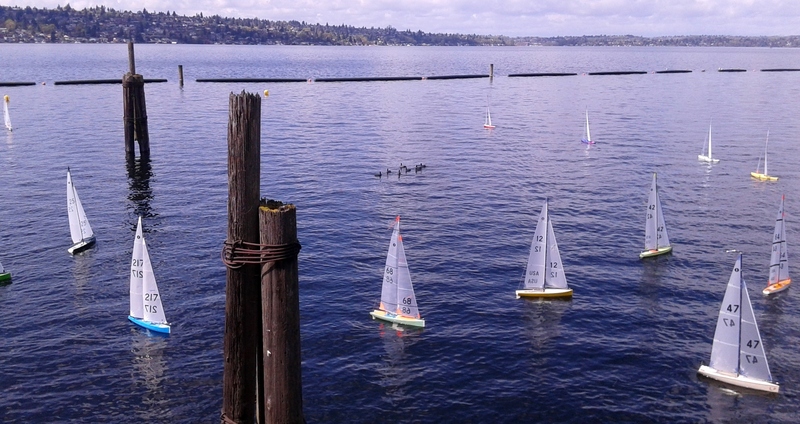 I linger to watch a little crew of ducks in the midst of the sails. They are slightly alarmed but stick together, paddling and keeping their distance from the unknown intruders. 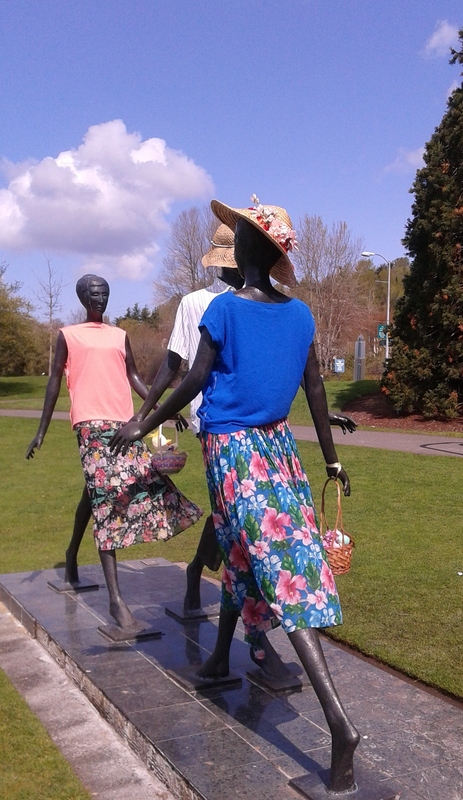 There’s a sculpture of walkers at the entrance to the park and now and again, someone dresses them for the seasons. Now they are kitted out in Easter bonnets, or so it appears to me. It’s been a rich hour and my busy week is far behind me, drifting away on the clouds and rippling lake waves.